Who: Colleen Macklin, John Sharp and Heather Chaplin. We’re two game designers and a journalist. We were generously funded by the Knight Foundation’s prototype grant fund. What: Using game design, play theory and systems modeling to create new journalism products that reveal the complexity behind the headlines. Where: The New School, New York City. Why: Journalism’s primary form has been linear. We wanted to use interactive and playful systems to express the dynamic relationships within the events in the news and move beyond the myth of linear causality. Could exploratory, playable-models help in the hunt for new forms of journalism? Heather was a journalist covering the game industry. She met John and Colleen, professors of game design at Parsons who were making games for learning. (John used to be an art historian; Colleen was an interaction designer and artist). Over the years, John, Colleen and Heather grew increasingly passionate about bringing lessons from game design into journalism. This was the start of the Data Toys project: could we use play, interaction design and human-centered design processes to explore new journalistic approaches? A big focus in recent game studies is the design of games (engaging with a playable model) to help people understand complexity through systems thinking. Could we bring this idea into journalism and help people understand not only the headlines, but the complex systems behind the headlines? Could journalists take advantage of new technologies and these emerging ideas from game design to do a better job of showing the underlying ways in which the world work? Understanding how systems work is crucial to being an informed and engaged citizen. To be systems literate is to see the mechanisms underlying the goings-on in the world, whether it be the seemingly mundane system of roads, traffic signals and vehicles, or matters of international politics and climate change. Systems thinking is the study of wholes. To be systems literate, one must begin to see the interrelationships between components rather than just the components in isolation, and to recognize the dynamic, often changing nature of these relationships. Journalism has a role to play in explaining the complex systems that lie behind the headlines. The role of journalism is to report on the important events around us, but traditional linear narrative may not always be the best way to show how systems work. By giving people a playable model, the dynamic interconnectedness of the different components in a system become clear—whether that be relationships between government agencies or the way climate change is influenced by economic policies in one city, traffic patterns in another and wind conditions in a third. Play brings it all together. Just showing how systems work is not enough. Getting people to engage with systems fosters real and deep learning. When we play, we’re in an active and dynamic dialogue with ideas, other people and materials. We’re testing boundaries, developing strategies and learning about cause and effect. Play is also open-ended, enabling us to make choices and come to our own conclusions about how things work. Journalistic and open source values are key. For this kind of work to succeed in terms of winning the ongoing trust of users and gaining momentum, assumptions built into the work as well as methodologies and data sources should be transparent. In other words, show your work. In addition, to foster a community of practice, prototypes should be released under open source licensing. So how did we do this? We created prototypes to try to answer some of these questions. And in the process, some tension points emerged. Besides the prototypes themselves, we discovered the cultures of journalism and iterative design differed in fundamental ways. We found ourselves struggling to find language to explain our work, and to even find a common language for our team of journalists, designers and technologists. We quickly noticed the “no, but…” healthy skepticism of journalism and the “yes, and…” optimism of design; a tension between the speed of journalism and the more slowly-unfolding processes of human-centered design; the differences in data-driven and systems-thinking processes; and the importance of accuracy in journalism and the use of abstraction and simplification in design. Journalism culture and design culture are different. The way we came to think about it was the difference between the “yes, and…” culture of design versus the “no, but…” culture of journalism. Do you start with a playful experience and figure out a way to get it into a news model? Or do you start with an important event and then spin it out into a playable model? How do you maintain journalistic rigor and accuracy while allowing for experimentation and failure? We don’t think this is a deal breaker, but we do think there is future work to be done bringing the disciplines together. Playable models are not a replacement for daily reporting. That would be absurd. The kind of work we’re talking about is not the quick turn-around of daily reporting. Playable models may, however, be ideal for helping express certain kinds of complex stories that elude traditional linear storytelling — climate change, corruption, foreign conflicts, global poverty, immigration, food, etc. Playable models should be thought of as part of larger reporting packages, and the time involved in the design process needs to be considered. There is also opportunity for modeling systems that change over time as the news changes and new data emerges. When we started the Data Toys project, we started with data sets. What we discovered, however, is that starting with data is not necessarily the best way to understand and model the underlying system behind a story. In fact, we found ourselves wondering if “Data Toys” was even the right name for our work. When we changed tactics later on, we found that coming to understand the moving parts of a system and how they connected first was more useful – this allowed the “story” in the system to reveal itself. This was a more natural process for the designers on the team, but more challenging for the journalists. One of the biggest challenges in designing representations of anything is what to leave out and what to include. We found ourselves wondering: How do we maintain accuracy when we create models that isolate out some of the complexities of the real-world? Our approach: to perform what we call ‘faithful abstraction’ – choosing the core elements of the system that we want to model in order to represent the story we are telling. Models of the universe like orreries (those solar system models you played with as a child) sacrifice accuracy for convenience. If an orrery is to fit in one room, it cannot be built to scale. Scale models of the solar system have been built, but they span a kilometer and the earth is scaled down to the size of a peppercorn. This is also a conundrum faced by journalists, who are always looking for angles and telling stories from specific vantage points. We realized that these issues are inescapable as a representation is, inherently, not the thing itself, and there’s no such thing as no perspective. While these tensions were present throughout the project, they were by all measures constructive. In many ways, identifying and articulating these tensions may have been the most valuable part of this project. They helped us see the challenges and opportunities in bringing the cultures of journalism and design together and inform our future work beyond Data Toys. Just a cursory glance at the project’s legacy lets us know we are on to something. Heather drew upon the Data Toys project to help shape the Journalism + Design program at The New School and is working on a longer white paper on playable models for the Woodrow Wilson International Center for Scholars; Jane Friedhoff, a project fellow, joined the New York Times R&D Lab; and the team shared ideas and processes with the likes of Radiolab, Public Radio International and The Migration Policy Institute. We are all excited about the potential of design-empowered journalism and continuing to explore play as a vehicle for creating a more engaged and informed audience. I can’t tell you how many times I’ve had a story published, re-read it, and realized that it was a complete failure – that it wasn’t true. It’s not that my work isn’t accurate. It’s just that the pursuit of mere accuracy is one of the great pitfalls of contemporary journalism. The problem as I see it is this: to make a linear, narrative-driven story work, you have to streamline and simplify to such an extent that what you’re saying no longer expresses the truth in any kind of holistic way. This is what stories are – human attempts to simplify and make sense of a world that feels chaotic. But what if what we perceive as chaos is actually complexity? Complex is not the opposite of simple. It refers to a certain level of interconnectedness. But because we aren’t used to thinking in terms of interconnectedness, we get confused. And so, in response, we make up stories that we think will save us from what is a misunderstanding in the first place. We live in an increasingly complex world, and we have to begin thinking in terms of interconnectedness. We all live, now, in an interconnected web, in which the action of every part affects every other part. If we want any hope of solving problems such as climate change or income inequality, we have to get good at thinking like this. Some people call this “systems thinking”. What would journalism look like if it went beyond telling stories and grappled directly with interconnectness and complexity? How can we represent complexity – how can we show the systems at work behind any news story – in a way that reaches people and resonates for them? When I was first covering videogames, I heard someone say that what made games unlike other forms of media was that they were models. Think about the railway system. You could read a big book about it, or you could play with a model railway. If the model were detailed enough, playing with it would allow you to understand how the system works, to a degree that a book can’t match. You’d be experiencing in motion all the elements that led to, say, why and how a train arrives on time, or doesn’t. In other words: some mediums are better at expressing certain ideas than others. The idea behind the Data Toys project is to see if we can bring the rigor of journalism to the challenge of representing complexity, by giving people models – toys – with which they can play. Might data toys, or something like them, have a role to play in moving us beyond mere accuracy? One of the biggest challenges in designing representations of anything is what to leave out. For Data Toys, this is a particular challenge because with a toy, a large portion of the information the toy emerges through the player’s experience. This is at the heart of what we find powerful about the potential for Data Toys: they allow the player to discover how the system behaves, and not through a detailed description of its individual elements. This is also how a Data Toy differs from a data visualization; while both are interpreted, a Data Toy can only be interpreted as it is manipulated. It may suggest multiple things at different times and in different states, making the development of understanding a dynamic and subjective act – hard to pin down at any one moment, but leading to a richer understanding of how the elements in the system are connected. This leads to an interesting conundrum. How do we maintain truthfulness when the interpretation of a Data Toy is always in flux? How do we scale a system so that it can be played with and understood? Like a map, something is always lost in the translation, and something is gained too (the convenience of fitting it into your pocket, for instance). Models of the universe like orreries also sacrifice accuracy for convenience. If an orrery is to fit in one room, it cannot be built to scale. Scale models of the solar system have been built, but they span a kilometer and the earth is scaled down to the size of a peppercorn. It would be very difficult to create an orrery at scale — we would never be able to see the planets as they orbited the sun because they would be miniscule! The orrery is not meant to show us scale. It’s meant to show us how the planets behave. An orrery is a faithful abstraction along the vector of planetary orbits, but is not accurate when it comes to planetary scale and distance. For Data Toys, we are adopting the idea of faithful abstraction much like the how orrery does – to be able to accurately describe how a system behaves over an accurately representation of its elements, for it is rare to be able to do both, or to model every element in a system. To create Data Toys with journalistic integrity, we have adopted the open journalism credo of “showing our work” – providing a detailed description of our methods and the original data set so that others can extend our work, and if they desire, create renditions of the data like the scale models of the solar system, peppercorns a kilometer apart. One question comes up frequently when we talk to people about Data Toys—why toys instead of games? This is a great question, one that gets to the heart of the research project. It is also a fair question given the PETLab team’s interest in games. We are interested in toys rather than games for a number of reasons, but the most important is this: games encourage goal-oriented play, while toys allow open-ended, self-directed play. Let’s use Greg Costikyan’s important 1994 essay, “I Have No Words and I Must Design.” Costikyan uses as an example a basketball. The ball itself has certain characteristics that suggest what it can do, but nothing about the ball suggests basketball. A basketball is a toy with which a player can do all sorts of things—throw it, bounce it, kick it, roll it, spin it, etc. There is an almost limitless set of activities players can do with the ball. Basketball, on the other hand, is a game that happens to use a particular kind of ball as part of its play. Where a basketball allows for self-directed play, the game of basketball has rules and procedures for how the ball can be used in pursuit of the game’s goal. In the spirit of Froebel’s Gifts, we want Data Toys to encourage open-ended, self-directed play. We feel this is important for allowing players to find their own understanding of the systems embodied in the toys. It is safe to say that the Data Toys project would not exist without Donella Meadows. Meadows was a student of Jay Wright Forrester, the MIT professor who founded the field of systems thinking as part of his work in the Sloan School of Management. 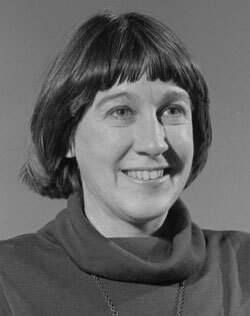 While Forrester focused on business applications of systems thinking, Meadows looked toward ecology and the many issues relating to humanity, climate and the environment. “A system is an interconnected set of elements that is coherently organized in a way that achieves something…. a system must consist of three kinds of things: elements, interconnections and a function or purpose.” Let’s take the solar system as an example. The planets, the sun, gravitational pull, the atmosphere of outer space are all elements in this rather large system. These elements all have different relationships or interconnections—the planets revolve around the sun due to the sun’s gravitational pull within the constraints of the atmosphere of outer space. The important thing to identify is a system’s function. Sometimes this is straightforward. The education system functions in order to educate children (at least that is one of its purposes). The NYC subways function to allow New Yorkers to move about in a cost-effective, quasi-speedy manner. But what about the solar system? Or the U.S. economy? Identifying the function of a system is not always easy, but it is the most important thing to understand in order to understand its strengths and weaknesses. The most important thing for us in Meadows’ take on systems thinking is its role in the problem solving process. Meadows speaks about the leverage points in a systems —the places where change can be affected. In order to know how we can address the problems in a system, we need to know what all the elements are, and how they interact with one another. Meadows uses as an example the bathtub. If the tub is getting close to overflowing, what are the leverage points for stopping water from spilling? slowing down the flow by adjusting the spigot, removing the plug in the drain, introducing new elements like a bucket to remove the water, etc. By understanding the system and the way the elements interconnect, we can identify solutions to the problem. Systems thinking is the hook of the Data Toys project, and the thing we hope to be able to help other recognize as an important tool for understanding the world around us. Back when Colleen, Heather and I began discussing a research project, we fairly quickly decided we wanted to focus on systems thinking. 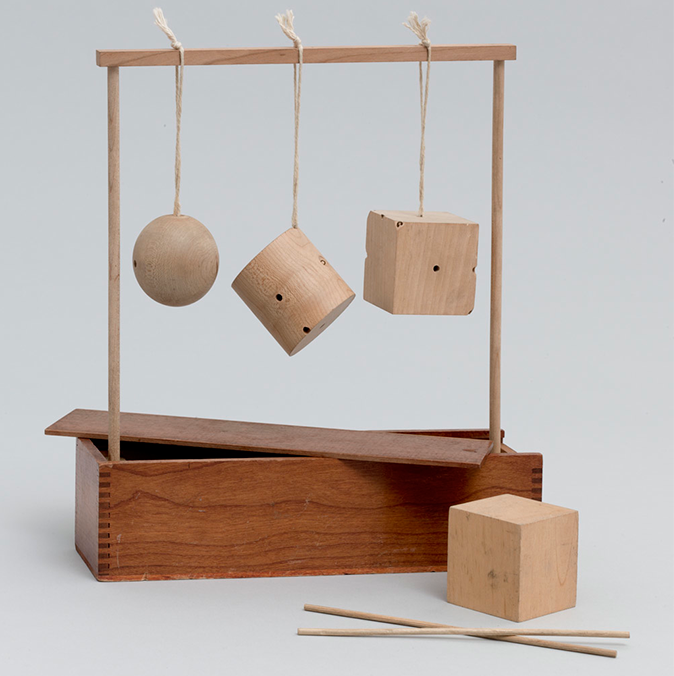 As we were considered the challenges of introducing a way of thinking about the world around us, we came upon a couple of key precedents that informed the origins of the Data Toys project—orreries and Froebel’s Gifts. We realized that orreries were a wonderful representation of a very large, complicated system—the solar system. 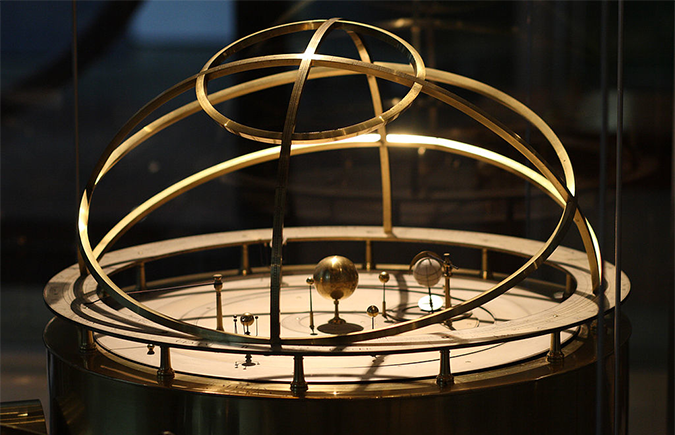 By looking at an orrery, we can imagine and begin to understand the elements in the system and their relationship to one another. And by playing with the orrery, we can experience how the planets move, the relationships they have to one another, and how those relationships change over time. Orreries helped Heather, Colleen and I understand that play, and the ability to experience a system in action is important to making systems knowable and legible. We were also inspired by Froebel’s Gifts, the educational toys at the foundation of kindergarten and early childhood learning. Friedrich Wilhelm Froebel was a German educator who focused on early childhood education. As part of his work, he developed a series of “gifts,” or toys that allowed free play through designed objects—wooden blocks, colored balls of yarn, rings, sticks, and other similar materials. Froebel believed that through free play, children would develop spatial reasoning, basic color theory, and other basic tools of perception and reasoning. More importantly, Froebel hoped his gifts would inspired children to see the world around them as learning opportunities, and to instill an inquisitiveness that would continue into their adult lives. From Froebel’s gifts, Colleen, Heather and I were inspired to create a similar set of projects that might help us all see the systems underlying the world. 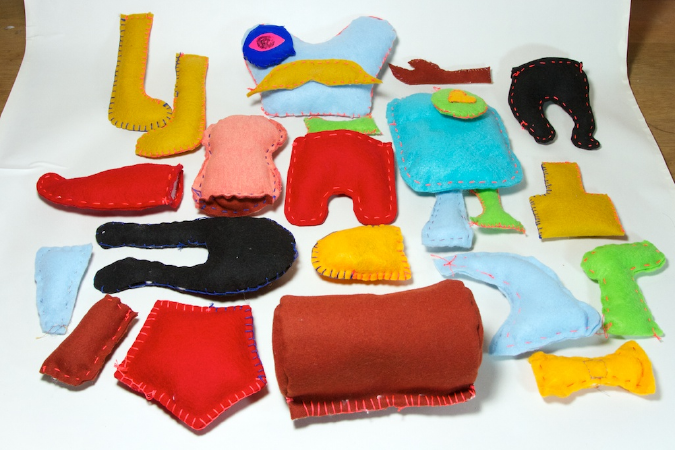 So thanks to planetary toys, wooden blocks and balls of yarn, we began the Data Toys project. Thanks to the Knight Foundation, the Data Toys project is making its debut at SxSW Interactive. Colleen will be on the NewsBots panel on Saturday at 5pm, and then that evening, Colleen, Heather and John will be at the (private, unfortunately) Knight/Mozilla/MIT Media Lab/SoundCloud event that evening doing demos. They will be back at it at 11 am both Sunday and Monday at the Knight Foundation booth on the trade show floor. The initial prototypes we will be showing are the initial work we have done with our partners from Public Radio International and the Migration Policy Institute. We’re working together to explore how to create data toys that investigate the immigrant experience in the United States. MPI has prepared a set of data on 25 American cities collected in 2000, 2005 and 2010. So far, we have written an API to help tap into the data and then three different tablet-based experiments to model the underlying systems that impact the immigrant experience in the United States. We still have a long way to go with the project, but we are excited to share our work so far and to see what people at SxSW Interactive have to say. So if you are in Austin for SxSW Interactive, try to stop by and say hi and see what we’re up to. Infinity is a simple and clean WordPress Theme. Easy Customize through Theme Options. Infinity features: custom background, drop-down menu, header logo, highly customizable and adaptable, theme options, post excerpts with thumbnails, SEO friendly, translation ready, W3C valid, widget-ready, threaded comments & more. It is tested major browsers – Mozilla Firefox, Internet Explorer, Opera, Safari and Chrome. Infinity is suitable for any business or personal website.